Tallowa Dam features Australia's largest mechanical fish lift. Water supply infrastructure, such as dams and weirs, can be a barrier to fish movement in rivers. In recent years, WaterNSW has carried out a series of innovative projects to improve fish passage at one of its dams and on numerous downstream weirs on the Hawkesbury-Nepean River. Tallowa Dam is situated 35 kilometres from Nowra on the confluence of Shoalhaven and Kangaroo rivers. Its 43 metre-high dam wall was a major barrier to the movement of fish migrating upstream on Shoalhaven River since it was built in the early 1970s. 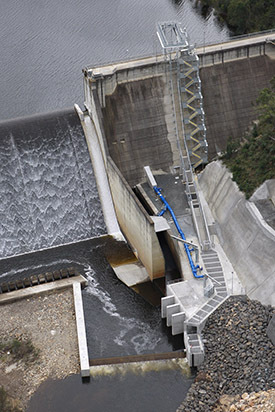 In 2009, when Tallowa Dam was upgraded to improve environmental flows, WaterNSW took the opportunity to design and install Australia's largest mechanical fish lift. The system works by initially releasing water from the lake into a confined channel at the base of the dam. Fish are attracted to this channel and into a 'lift'. At set times the lift climbs 30 metres over the dam wall carrying 2,500 litres of water including fish. Fish are then released into the lake and can resume their journey upstream. In addition, a new fishway helps fish travel in the opposite direction as they migrate downstream. Over 10 native fish species have been given easy access up and down the river by the fish lift and fishway. The changes have restored full access for fish species to 75 percent of the Shoalhaven River system. Monitoring work is being undertaken by WaterNSW, Department of Primary Industries and Southern Bass Fishing Club to assess the success of the project. Fish in the Hawkesbury-Nepean River have responded well to the new fishways at 10 weirs on the river that were installed as part of a project to upgrade weirs in 2009 to prepare the weirs for the environmental flows from upstream dams. The fishways installed comprise of a series of interconnected pools and resting areas for fish which gradually swim up a slope to get to the upper level of the weir. The vertical-slot design used is proven to be effective with native fish in Australia. Monitoring of fish in the river carried out by the NSW Department of Primary Industries indicate the fishways are benefiting all fish in the river and highlight positive improvements for the river's overall fish community. A range of techniques were used in the four-year study to assess whether fish are using the new fishways. These included electrofishing surveys, direct trapping of fish at the fishways and fitting fish with electronic tags in order to track their movements. Samples were taken at 20 sites along the river before and after the completion of the new fishways. The surveys confirm that fish as small as 25-30 mm in length (for example Australian smelt and Cox's gudgeons) as well as by larger fish including Australian bass and Freshwater mullet (60 mm to 400 mm long) and Long-finned eels up to 1200 mm in length are all using and benefiting from the fishways.